Is your water main leaking? Don’t pay for a plumber to dig up your front yard all day. You need to have a leak detection performed. We can get experienced technicians to use the latest in acoustic leak detection equipment to locate your water leak, saving you money. Much like a doctor’s stethoscope, the electronic listening equipment is used to listen for water leaks in the ground. The ground microphone amplifies the noise of the water leak allowing the technician to accurately locate the water leak without digging up your lawn or breaking up your driveway. In conjunction with acoustic leak detection, the technicians use pipe tracing equipment to actually trace your water main to begin with. 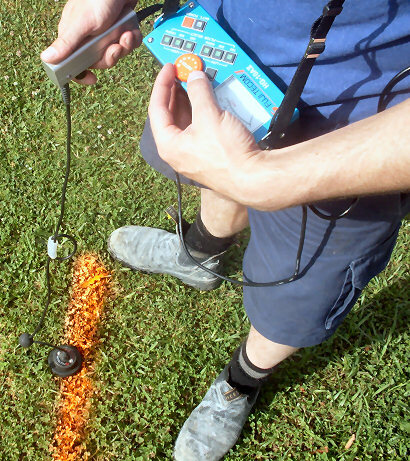 Pipe tracing allows them to accurately identifying the path your pipe takes from the meter to your house and the depth at which it is buried. This significantly narrows down the search area and allows for far more accurate leak detection. Sometimes you can be unfortunate enough to have multiple water leaks in your plumbing system. In these situations our equipment will generally identify the biggest leak first. If your meter is still ticking over after the initial repairs have been made then another leak detection will be required to locate other smaller leaks on the system.